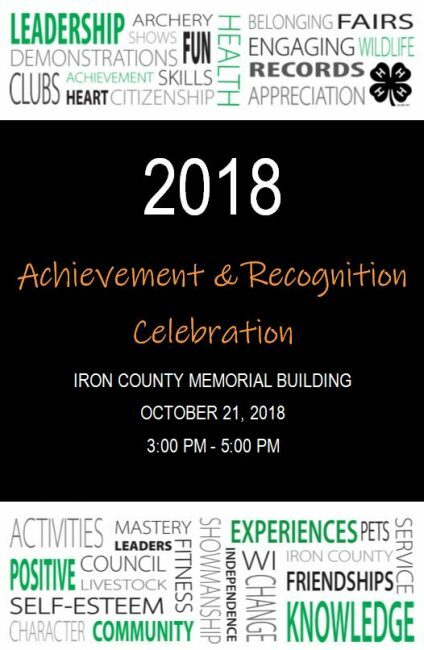 2017-2018 Iron County 4-H members and volunteers were recognized for their achievements at the annual Achievement & Recognition Celebration, which took place at the Iron County Memorial Building on Sunday, October 21, 2018. 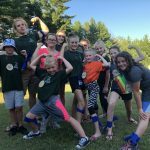 The celebration started with a dinner that included pizza, pasta, and salad from the Iron Nugget and was followed by an awards ceremony. Iron County 4-H Youth Development Educator, Neil Klemme discussed the success of his 4-H program and thanked the volunteers for all they do, stating that, “A county 4-H program is only as strong as the volunteers who step up to lead.” Klemme also mentioned that the program is growing in Iron County and with new members, comes a need for more leadership opportunities. Youth members from each club spoke about their 4-H experiences and presented their peers with achievement pins. Iron County Green Team member, Luca Villanueva discussed his experiences at Space Camp, which he attended at the end of April. Penokee Range 4-H Livestock Club member, Dayne Stuhr discussed his experiences as a 4-H member, highlighting leadership, community service, and public speaking as the most valuable outcomes from his 8 years in 4-H.
For more information, check out the Achievement Night program, which is posted below! 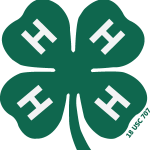 If you would like to learn more about Iron County 4-H, please call Neil Klemme at 715-561-2695 or contact him via email at neil.klemme@ces.uwex.edu.